Home / Lifestyle / Fashion / Is Expensive Mascara Always Better? A recent Youtube trend caught my attention when Buzzfeed’s channel, “As/Is” made a video entitled, “I Tested the Most Expensive Mascara at Sephora.” This video with 1.3 million views was exciting, and made me think about if I was wasting my time and money on expensive products. I soon fell into a spiral of makeup testing videos, becoming especially interested in the ones about my favorite product: mascara. I, Anna Nichols, “the opposite of a makeup artist” decided to try out an experiment that was once popular on YouTube. This trend, “testing cheap beauty products vs. expensive products” went viral, and soon everyone was running out to their CVS and Sephora to snag new products. So, being the curious person I am, decided to take a leap of faith and try out this experiment. . .using mascara. Like a zombie, when I wake up my eyes are dark and tired, so I apply a few coats of my average mascara. I have always used the same Covergirl, “So Lashy” mascara, but that was about to change. I strolled into CVS at eight o’clock at night and headed to straight to the makeup aisle. On the display case, there were all types: brown, brownish black, black, blackest black, waterproof and regular mascara. All of the mascaras on the top and middle rows averaged around $9.00. As I was slightly losing hope on finding a super cheap mascara, a little green and pink neon bottle caught my eye from the bottom shelf. I laughed to myself realizing this marketing structure. Places like CVS, use this move and grab the consumers attention by placing the most expensive product right before their eyes. Not falling into this marketing trap, I examined the bottle and it read “Maybelline: Great Lash Waterproof ($6.00).” My mom and I left CVS with a long receipt (with many coupons) and a new, cheap mascara. My second journey to look for the expensive mascara lead me to Sephora. There, I scoured the store like a lost kid at a candy shop, admiring all of the pretty packagings. Here at Sephora, it is set up in sections for products and their brands. So, it was a bit easier to find an expensive brand of mascara. As I made my way around, I stumbled across the Tarte section. Keep in mind, throughout this process I was looking for expensive, but still “affordable” mascara for high school students (especially those who make their own money). My choice from Sephora was the “Tarte: Lights, Camera Splashes Waterproof ($19.00. )” About three times more than the Maybelline! As I woke up the morning of the experiment, I looked in the mirror and mentally planned my day. My plan was simple: apply the cheap mascara to my left eye and the expensive mascara to my right eye. Once both products were applied, I looked up expecting to see the worse…but to my complete surprise they looked THE SAME! This baffled me at first, but as a thought about it, I realized that since I got the same kind of mascara (waterproof and black), people might not actually notice a difference. At approximately 7:00 A.M. my experiment started. I approached my fellow classmates and asked them to pick the eye that they liked better. Asking a handful of kids, including both males and females, the votes were pretty close, with the expensive leading. But, as the day progressed, more and more people told me that they liked my left eye better, the one with the cheap mascara. 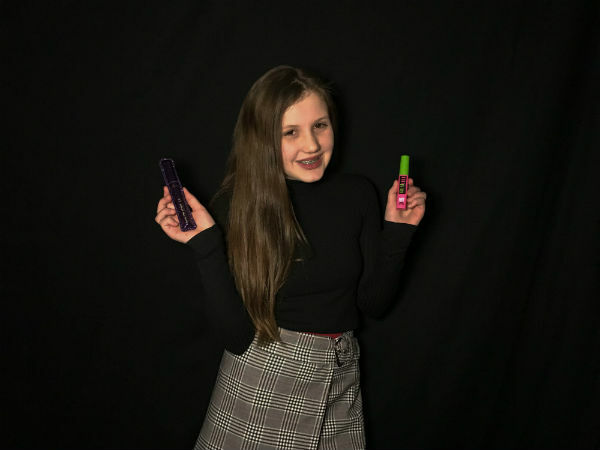 Overall, with a total of 20 voters, the cheap mascara with 12 votes, beat the expensive with eight votes. From my personal experience of wearing these two products, I would say that I favored the expensive brand of mascara (Tarte) because I thought the quality was excellent and the wear was glamorous. However, the cheap mascara showed similar results when it came down to the presentation. I wanted to do this experiment to show that anyone can slay, even when on a budget. Even if the cheap mascara was an emergency grab option, I wanted to show that the presentation of the two is similar, with only slight differences. Yes, the quality of the expensive product was better, but look wise there really isn’t a difference when it comes to cheap vs expensive. So, don’t “bat an eyelash” the next time you are balling on a budget. ← Previous Story My Unclear Future–Where Will I Be In Ten Years?